The use of local solar time became increasingly awkward as railways and telecommunications improved. American railroads maintained many different time zones during the late 1800s. Each train station set its own clock making it difficult to coordinate train schedules and confusing passengers. Time calculation became a serious problem for people traveling by train (sometimes hundreds of miles in a day), according to the Library of Congress. Every city in the United States used a different time standard so there were more than 300 local sun times to choose from. Time zones were therefore a compromise, relaxing the complex geographic dependence while still allowing local time to be approximate with mean solar time. Railroad managers tried to address the problem by establishing 100 railroad time zones, but this was only a partial solution to the problem. Weather service chief Cleveland Abbe had needed to introduce four standard time zones for his weather stations, an idea which he offered to the railroads. Operators of the new railroad lines needed a new time plan that would offer a uniform train schedule for departures and arrivals. 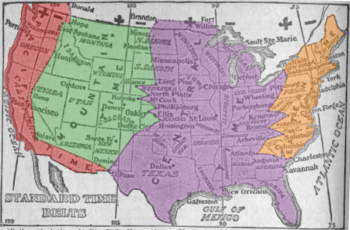 Four standard time zones for the continental United States were introduced at noon on November 18, 1883, when the telegraph lines transmitted time signals to all major cities. In October 1884, the International Meridian Conference at Washington DC adopted a proposal which stated that the prime meridian for longitude and timekeeping should be one that passes through the centre of the transit instrument at the Greenwich Observatory in the United Kingdom (UK). The conference therefore established the Greenwich Meridian as the prime meridian and Greenwich Mean Time (GMT) as the world's time standard. The US time-zone system grew from this, in which all zones referred back to GMT on the prime meridian. In 1960, the International Radio Consultative Committee formalized the concept of Coordinated Universal Time (UTC), which became the new international civil time standard. UTC is, within about 1 second, mean solar time at 0°. UTC does not observe daylight saving time. Standard time zones in the United States are currently defined at the federal level by law 15 USC §260. The federal law also establishes the transition dates and times at which daylight saving time occurs, if observed. It is ultimately the authority of the Secretary of Transportation, in coordination with the states, to determine which regions will observe which of the standard time zones and if they will observe daylight saving time. As of August 9, 2007, the standard time zones are defined in terms of hourly offsets from UTC. Prior to this they were based upon the mean solar time at several meridians 15° apart west of Greenwich (GMT). Alaska Time Zone (UTC−09:00; Zone V), which comprises most of the state of Alaska. Samoa Time Zone (UTC−11:00; Zone X), which comprises American Samoa. Chamorro Time Zone (UTC+10:00; Zone K), which comprises Guam and the Northern Mariana Islands. Atlantic Time Zone (UTC−04:00; Zone Q), which comprises Puerto Rico and the US Virgin Islands. Some United States Minor Outlying Islands are outside the time zones defined by 15 U.S.C. §260 and exist in waters defined by Nautical time. In practice, military crews may simply use Zulu time (UTC±00:00) when on these islands. Baker Island and Howland Island are in UTC−12, while Wake Island is in UTC+12:00. Because they exist on opposite sides of the International Date Line, it can, for example, be noon Thursday on Baker and Howland islands while simultaneously being noon Friday on Wake Island. Other outlying islands include Jarvis Island, Midway Atoll, Palmyra Atoll, and Kingman Reef (UTC−11:00); Johnston Atoll (UTC−10:00); and Navassa Island, Bajo Nuevo Bank, and Serranilla Bank (UTC−05:00).